Los Angeles, October 5, 2016 — The green building industry’s first and leading consortium of program operators announced today at Greenbuild the addition of two new members and an enhanced technical advisory board. CSA Group is now a member, while thinkstep is an affiliate member. This marks the first anniversary of the Program Operator Consortium (POC), which launched last year to provide simpler, standardized and more useful environmental product transparency solutions and to reduce complexity in the marketplace. The consortium serves as an expert resource and advocate for creating product category rules (PCRs), reviewing life cycle assessment reports (LCA), and verifying and publishing environmental product declarations (EPDs). EMERYVILLE, CA Sep 8, 2016 – SCS Global Services (SCS), a leading third-party certifier of environmental, social, and quality performance claims, is pleased to announce that it has joined the Program Operator Consortium (POC). The Consortium is comprised of standards developers and certifiers specializing in the development of Product Category Rules (PCRs) and the certification of Environmental Product Declarations (EPDs), working together to advance environmental product transparency in the marketplace. Sustainable Minds®, a B2B cloud provider of environmental product transparency applications, services and data, has introduced the 2016 SM Transparency Report™ / EPD Framework bringing major advancements to the process of creating and delivering environmental product transparency reports. Since the Program’s inception in 2014, the goal has been to reduce creation time and costs while increasing usefulness and value. The SM Transparency Report™, Sustainable Minds’ brand of EPD, is designed to inform greener purchase decisions by making LCA and environmental performance information understandable and meaningful, in three pages, in the cloud. They are strategic marketing tools that turn disclosure into brand value by integrating product transparency into product marketing to build a credibly greener brand. SAN ANTONIO April 13, 2016 —Today, a first-of-its-kind consortium in the green-building industry convened 15 manufacturers and industry representatives from around the world to hear their needs for enhancing product transparency and stewardship through effective product category rules (PCRs), life cycle assessment reports (LCAs), environmental product declarations (EPDs), and next generation product transparency solutions including Sustainable Minds Transparency Reports™. Sustainable Minds was featured as a provider of voluntary product stewardship solutions (vs. compliance-based solutions) along with 7 other companies including industry staples PRé Sustainability, Quantis International and thinkstep. 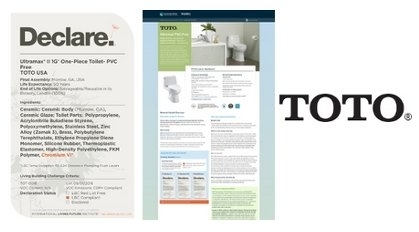 MORROW, Ga., Nov. 18, 2015 /PRNewswire/ -- TOTO, the largest plumbing manufacturer in the world with $5.1 billion in annual sales, announced today that its high-efficiency commercial wall-hung toilet, two ultra high-efficiency urinals, and wall-hung commercial lavatory have no Red List ingredients and are listed in the International Living Future Institute's (IFLI) Declare Products Database as "Red List Free." WASHINGTON, November 17, 2015 — On Wednesday, four key green-building stakeholder organizations (ASTM International, ICC Evaluation Service, NSF International and Sustainable Minds) will launch the first Program Operator Consortium in the industry. The signing will take place at Greenbuild 2015 at the ASTM International booth (#3313) at 10:30 a.m. The consortium will serve as an expert resource and advocate for creating product category rules (PCRs), reviewing life cycle assessment (LCA) reports, and verifying and publishing environmental product declarations (EPDs). The consortium members will pool resources, leverage existing relationships, jointly conduct outreach, marketing, education and communications, and promote the overall use of PCRs, LCAs and EPDs in the marketplace. Manufacturers, design professionals and others will begin to see co-branded, verified EPDs from the consortium members, providing value to decision makers when specifying materials and products while helping manufacturers gain greater visibility for their product transparency work. MORROW, Ga., Sept. 17, 2015 /PRNewswire/ -- Committed to transparency in the manufacture of products that contribute to a healthy, sustainable environment, TOTO announced today that it has achieved another plumbing industry first by offering material health evaluations for an initial six high-efficiency toilets (HETs). TOTO is now the only plumbing manufacturer whose products have earned the International Living Future Institute's (IFLI) Declare label and are listed in the Declare Products Database. Often compared to the nutritional labeling found on packaged food, Declare labels focus on specific information important to consumers and building industry professionals by offering a transparent platform for the disclosure of materials, chemicals and elements known to pose risks to human health or the environment. After a thorough investigation of their constituent materials, TOTO's initial six HETs have been listed in the Declare database as Living Building Challenge Compliant or "declared." (Cambridge, MA) SEP 14, 2015 – Sustainable Minds, the first cloud software provider and program operator to focus on simplified and understandable environmental reporting, has introduced the SM Material Health Overview — the next in its suite of Transparency Products. The SM Material Health Overview (MHO) is a strategic marketing and lead generation tool for building product manufacturers to inform safer and healthier purchase decisions. They make material health information understandable and meaningful by distilling the essential technical information from a disclosure, providing plain language interpretation and describing what the manufacturer is doing to improve. Based on the award-winning SM Transparency Report™, an innovation in environmental product declaration (EPD) design and delivery, the SM Material Health Overview also includes functional performance information and product specifications. CAMBRIDGE, MA, APRIL 2: Sustainable Minds®, a B2B cloud provider of environmental product transparency applications, data and services, today announced that the Sustainable Minds Transparency Report™ Program received a Top Product of the Year Award in the Environmental Leader Product & Project Awards. 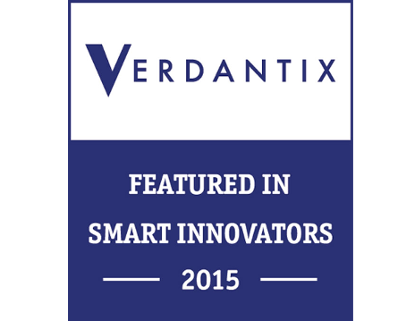 Judges considered it to be an exemplary product.